With the F.D.A. agreeing to new trials to test MDMA (better known as Ecstasy) as a treatment for PTSD—which, if approved, could be available as a drug by 2021—Acid Test is leading the charge in an evolving conversation about psychedelic drugs. Despite their current illegality, many Americans are already familiar with their effects. Yet while LSD and MDMA have proven extraordinarily effective in treating anxiety disorders such as PTSD, they still remain off-limits to the millions who might benefit from them. Through the stories of three very different men, award-winning journalist Tom Shroder covers the drugs’ roller-coaster history from their initial reception in the 1950s to the negative stereotypes that persist today. 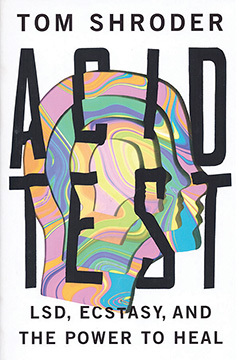 At a moment when popular opinion is rethinking the potential benefits of some illegal drugs, and with new research coming out every day, Acid Test is a fascinating and informative read. Published at $17.95, our price only $16.95. “Shroder filters the psychedelic world [and] presents a compelling case for supporting responsible, rigorous research of psychedelic compound… Empty your mind of any preconceptions about psychedelic drugs and enjoy a fascinating trip through the politics, science, history, and promise of these controversial chemical compounds.”—Booklist.